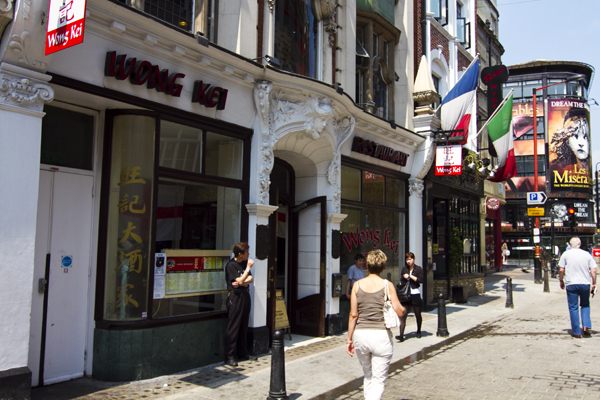 Wong Kei, in Chinatown, used to have the rudest waiters in London. Not anymore. Photos by David Lansing. So, with nothing better to do today, I took the Tube to Leicester Square and started walking up and down the back streets of Chinatown. I don’t know what I was thinking. Do you know how many restaurants there are in Chinatown? At least ten thousand. Okay, maybe not that many, but a hell of a lot. I had no address, no landmarks, nothing. Just “the legendary Wonkey Chinese restaurant,” which, I discovered after asking every produce vendor in the neighborhood is not so legendary because no one had ever heard of it. But you know, it was nice out and as Mike Smith, the reader who sent me the e-mail, said, there was a certain energy to Chinatown that was fun to see, even if it looked like I was going to miss out on the supercilious rude waiters. And then, just as I came to the end of Wardour, the last street in Chinatown, there it was. Only it wasn’t “Wonkey” it was Wong Kei. Not that that would have made any difference in my search. Even though it was five minutes until noon, there was a big sign blocking the doorway proclaiming that the restaurant was closed. Since a waiter was standing just outside the door smoking a cigarette (I figured it had to be a waiter since he was wearing a black UPSTAIRS/DOWNSTAIRS t-shirt), I asked him how come the restaurant was closed. “Not time,” he said, blowing a ring of smoke my way. Evidently Wong Kei doesn’t open until noon; not five minutes to noon or even one minute to noon, but noon. Anyway, I have to say I was very disappointed in the service. Not only did they give me a very nice table on the ground floor facing the street, but the waiter was also very attentive and quick. 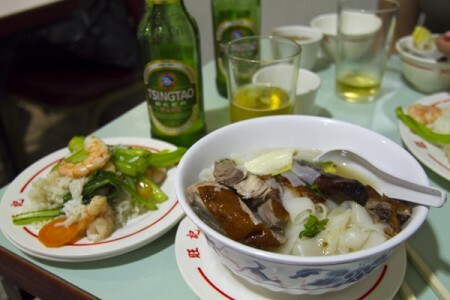 When I ordered a Tsingtao, it was on the table in less than 30 seconds. When I asked the waiter what was good, he actually hunched over the menu and gave me his opinion about three or four dishes. The aromatic duck with pancakes was very good he said. “That sounds like crap,” I said, trying to make him cranky. It didn’t work; he nodded in agreement. Finally, with a big smile, he offered to have the chef cook up something special for me. What the hell? Where were the supercilious rude waiters Mike Smith had promised me? As it was, I ended up getting the roast duck noodle soup, as Mike Smith had suggested, and it was delicious and enough food for two people, and then my waiter brought out a special Singapore seafood noodle dish that was to die for. “You like?” my waiter asked, grinning at me as I slurped it up. I shrugged with indifference. I’ve since learned that Wong Kei went through a renovation a few years back and some people say the service just hasn’t been the same. There’s talk on various restaurant bulletin boards of happy waiters and efficient service. They say that you can even get up from the table and go to the bathroom and when you get back, your food will still be there. Something that never would have happened four or five years ago. It’s a shame. It seems that even in London’s Chinatown, you just can’t get lousy help these days. I was there in the old days. The staff then wouldn’t even point the way to the men’s room. I have friend in London (who took me to this place) who has his top ten crappiest pubs tour. I remembered the first few, then they became a bit of a blur. The first one only had a three types of beer available. The second had one type of vodka, one gin, one whisky – and all of them generic, crap quality spirits. This reminds me, it’s probably time to do the tour again. A crappiest pub tour…I love that! Why does everything have to be “The Best….” whatever. Might be a book there, Allan. The worst pubs in England. Everyone would want to go, right? It would be awful to have artificial crap. I am surfing around on-line in excess of three time these days, but Irrrve never identified almost any intriguing content including the one you have. It’s very price tag adequate in my opinion. In my opinion, when almost all webmasters plus people made superb information when you does, the online world is going to be far more beneficial than any other time.